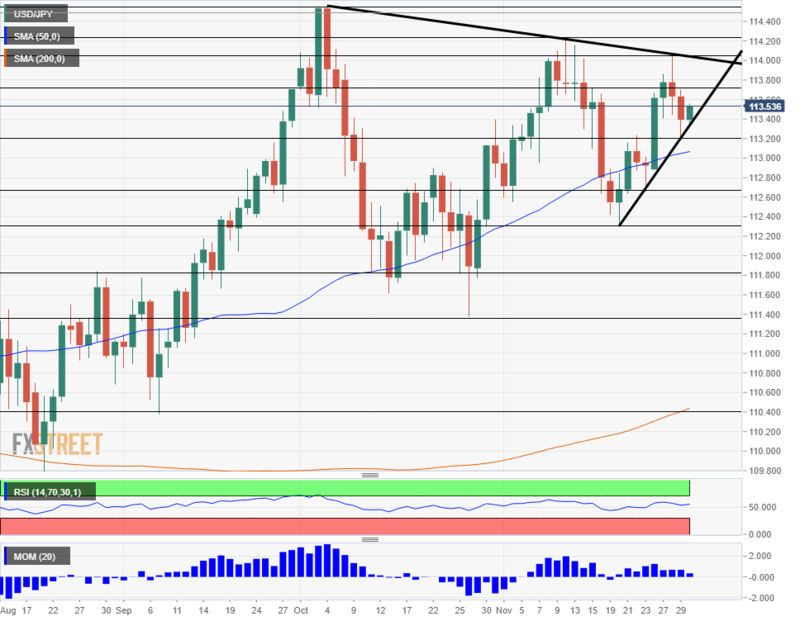 The USD/JPY had a busy and choppy week amid Fed action. 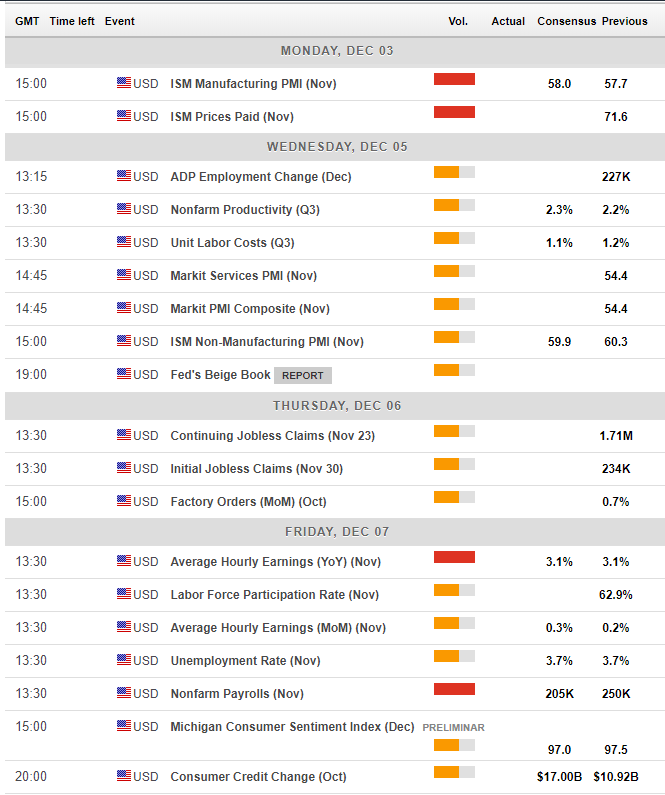 A full buildup to the NFP stands out, as well as trade talks. The charts show a narrowing wedge closing on the price. Experts are neutral in the short term but bearish afterward. Fed Chair Jerome Powell's testimony stood out. He said that rates are "just below" the range considered as a neutral rate. Stocks advanced and the US Dollar dropped as this was perceived as a hint that rate hikes are nearing their end. However, a closer examination showed a much more nuanced stance and the greenback made a comeback of sorts. Ahead of the summit between US President Donald Trump and his Chinese counterpart Xi Jinping, there were mixed signals. Trump said he is "close to doing something with China" while also saying that tariffs have a "long way to go." The Chinese ambassador to the US hinted that talks were not going anywhere fast. The resident at the White House has additional issues. His former lawyer Michael Cohen pleaded guilty to lying to Congress on the infamous Trump Tower meeting in June 2016. Trump's legal troubles continue and may develop in the new week. US data ranged between OK and mediocre. While GDP was confirmed at a high annualized rate of 3.5% in Q3, the increase in the inventory component implies a slowdown later on. The Fed's preferred measure of inflation, Core PCE, decelerated to 1.8% YoY, falling short of expectations. Jobless claims rose once again and unimpressive housing data did not help either. In Japan, retail trade surprised to the upside but the Yen did not react. Bank of Japan member Takao Masai repeated the central bank's known stance about maintaining the ultra-loose monetary policy. The BOJ remains the most dovish central bank in the developed world. The results of the weekend G-20 Summit will receive the full market reaction in the wake of the week in Asia. A favorable market outcome will send the pair higher and breakup will send it lower. Data comes in quite early in the upcoming week. ISM's forward-looking Purchasing Managers' Index for the manufacturing sector dropped to 57.7 points in October but the figure continues reflecting robust growth. Apart from providing guidance on the sector, the number also serves as the first hint towards Friday's Non-Farm Payrolls. The Prices Paid component was on even higher ground: 71.6 points. The Fed watches it for inflation. The second hint towards the NFP comes on Wednesday. The ADP Non-Farm Payrolls report for the private sector showed an impressive gain of 227K positions in October. A more moderate figure could be seen now. It is important to note that while the ADP NFP moves markets, the figure is not always well-correlated with the private sector portion of the official NFP. The third hint is due on Wednesday as well with the release of the ISM Non-Manufacturing PMI which printed an impressive 60.3 score in October, reflecting elevated growth. A slide from the highs may be seen now. Thursday's Initial Jobless Claims may be of interest after they unexpectedly increased in the past two weeks. Factory Orders, which advanced by 0.7%, are also worth watching. The big event awaits on Friday. The US jobs report was quite upbeat in October: 250K jobs were gained an Average Hourly Earnings finally accelerated above 3% to 3.1%. Current expectations stand at an increase of fewer jobs, 205K, which is still a healthy rise. Annual wage growth carries expectations of remaining unchanged at 3.1% while monthly salaries are projected to rise by 0.3%, better than 0.2% in October. This is the last jobs report before the Fed decision on December 19th. After Powell's comments and his reiteration of data-dependency, any shifts in the data may move the dot-plot: the number of rate hikes that FOMC members project for 2019 and beyond. An ongoing rise in both payrolls and earnings may please the hawks, while signs of weakness could convince doves and dollar bears. In the rare case, the NFP does not rock the boat, the University of Michigan's preliminary Consumer Sentiment measure for December will have the last word of the week. It will be interesting to see Americans' mood in the Christmas shopping season. The safe-haven Japanese yen attracts flows when stock markets are down and sells off when things improve. USD/JPY also remains highly-correlated to bond yields. The drop in US bond yields after Powell's speech was correlated with a slide in the pair. These factors will continue playing a role in the pair's behavior. The initial movement of the week will likely be a safe-haven one related to the G-20 Summit. North Korea is also noteworthy. It is one of the issues in the Trump-Xi encounter. Talks have stalled between the US and the rogue North Asian nation. The topis on the backburner for now, but a return of the rough rhetoric may boost safe-haven flows to Japan, despite its proximity to Pyongyang. The calendar shows a mix of events from the land of the rising sun. Foreign investments may be of interest after they dropped in the previous report. As the thick black lines on the chart show, USD/JPY is trading in a narrowing wedge. Downtrend resistance is more moderate and dates back to the 114.55 peak in early October. Uptrend support is steeper and has its origins in mid-November. The pair is currently closer to support. 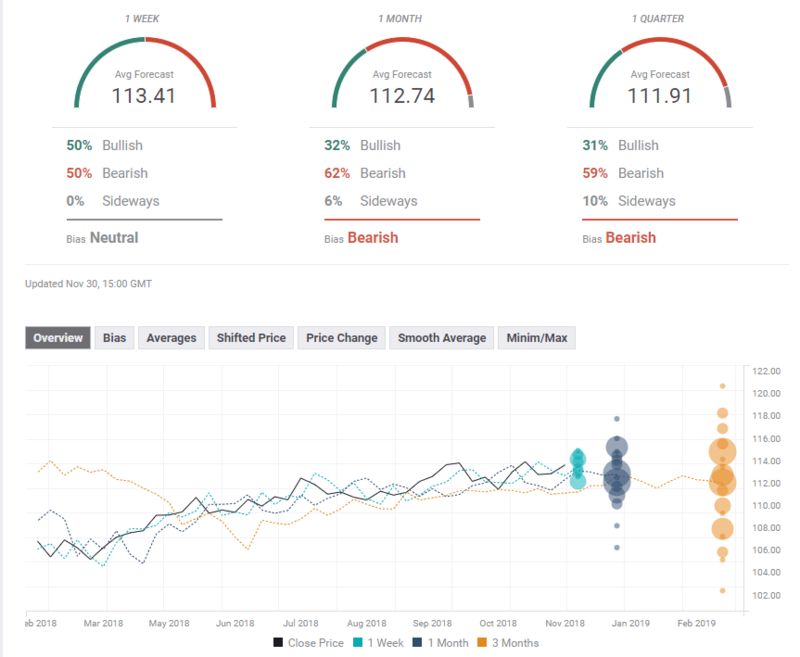 Momentum and the Relative Strength Index (RSI) on the daily chart are fairly balanced. 113.70 separated ranges on the four-hour chart. More importantly, 114.05 held the pair down in late November. Further above, 114.25 was a swing high earlier in the month. The 114.55 level mentioned earlier is the next level to watch. 113.20 served as support in late November and is closely followed by the 50-day Simple Moving Average. 112.65 was a swing high earlier in the month and also capped the pair in October. 112.30 was the lowest point in November and is backed and where the uptrend support line began. Lower, 111.80 provided support in October. The FXStreet forex poll of experts shows a neutral stance in the short term and bearish one later on, with lower targets as time goes by. The prices that are forecast have slightly dropped since last week.